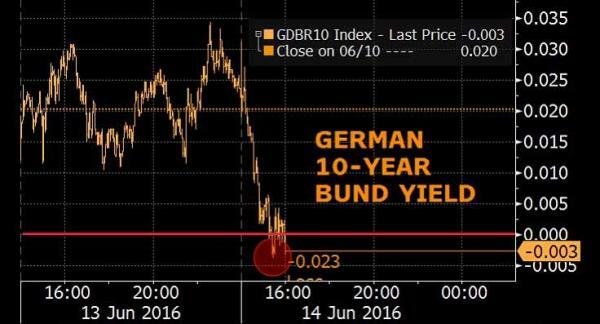 Investors were provided the "opportunity" during today's early hours of trading to purchase 10 year German government bonds at a negative yield. While yields have been hovering close to zero all week, investors can finally lend the German government their hard earned money for 10 years and pay the government to hold it. The bond market bubble shows no signs of slowing. Although we know this story will end in complete disaster it is fascinating to watch how low investors will bid these yields before the market implodes. Wondering what the next "Big Short" will be? It has arrived.